This spring, we started a project called Conflit à l’oeuvre, which focusses on understanding the links between conflict and “diversity” (systemic oppression) in the context of community organizations. The project has two main parts: first, to understand the issue through research. Second, we will be developing popular education tools, and offering workshops. We will be storing all of the resources and updates on this project here. Why is COCo interested in the link between conflict and systemic oppression/diversity? Having truly diverse teams requires organizations to change, and this can be present real challenges (and opportunities!) for groups. Supporting organizational change is what we like to do! Change around issues of diversity brings some unique challenges, and we wanted to understand them better. This means understanding what conditions need to be in place for diversity related change work to succeed, and what contexts might mean that diversity related work is likely to fail. There has been an increase in the requests we get for anti-oppression training because a group had an internal conflict related to diversity. 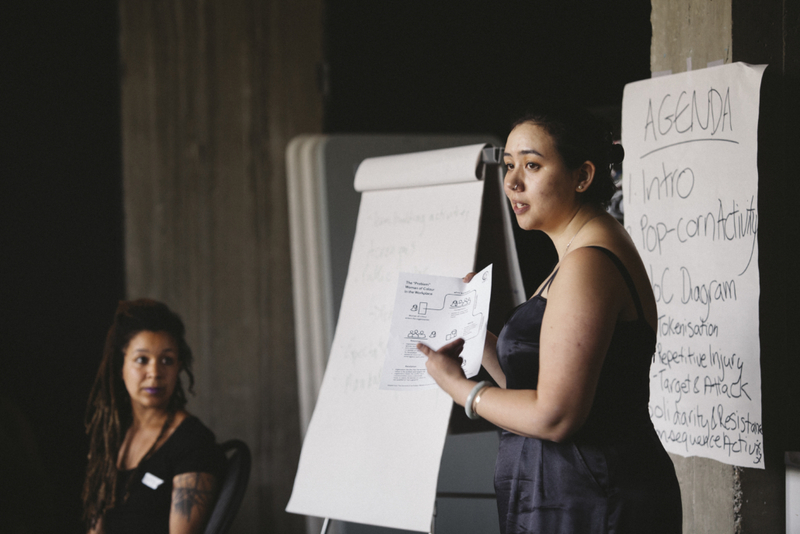 We also have more and more requests for conflict resolution processes that included issues related to systemic oppression, like sexism, racism, and ableism. Our research project Diversité d’Abord showed us that a lot of the problems around racism in organizations were marked by a lack of trust. We felt that conflict mediation can teach us a lot about building trust! Improve our ability, and the ability of other individuals in the community sector, to facilitate conflict resolution processes that are successful, as well as informed by an understanding of oppression and social justice. As facilitators and mediators, this means being better able to support the people who are most impacted by conflict situations, because of their personal experience of oppression. Support the retention and improve workplace conditions for individuals from historically marginalized groups in the community sector. This includes developing organizational practices that concretely support the long-term well-being and development of these groups. Emil, the researcher-facilitator who is leading this project, is scheduling interviews with people who have experience or insight on conflict, organizational change, and anti-oppression. If you, or someone you know, would like to be interviewed, please contact Emil Briones at emil@coco-net.org.